Alexandra Novozhenova is an art critic, art historian and lecturer. As an author and an editor she has been and is working for several figureheads in the Russian art media such as Colta.ru, Khudozhestvenniy zhurnal, Artchronika, Vedomosti, Afisha, Translit, Openleft, among others. She teaches the history of contemporary art at the Rodchenko Art School. Scholarly interests include Soviet art theory and sociology of Soviet art studies in the 1920s. She lives and works in Moscow. Between community, media, activism and artistic institution. Modalities of the critical in contemporary Russia. It can be very relatively said that critical modality of artistic thinking comes into being when the increasing quantity of producers and communities start to be concerned with the problematics of their local situation, rather than global art process with its specific law and hierarchy of authorities. This is what makes contemporary Russian «critical» art, developing under the condition of conservative turn, different from soviet non-conformism, which was very much guided by the western system of authorities and assets. We don’t only call critical the kind of art that has criticism—be that broadly-social or specifically institutional—as a content of its utterance or as a meaning of the work of art. It sometimes happens that the effects of direct activist utterance appear to be controversial or even opposite to the intentions initially in mind. And “critical” (or denouncing certain social injustices) artistic utterance placed in a gallery or in the museum might be blamed e. g. for its “decorative effect”, functioning not as a critic but as a gallery-content, softening antagonisms and affirming current status-quo. That is why we find important to consider critical the kind of artistic production that is not necessarily resurfaces in a broad media-discourse or in a gallery space, or at least isn’t limited to some gallery-or media-utterance. We find it important to rank critical also the activities of those ever-appearing and crossing communities, that are formed around educational, artistic, media and social initiatives, but do not necessarily have the “activist” identity. Such communities become the experimental laboratories of alternative sociality and new regimes of artistic and social production, and at the same time by intercrossing they produce the field of connections, that are easily activated, when in need is the direct political mobilization or a public civil statement. So the main thesis of this paper is that “critical” as such appears on the borders between communities, media and what we can still call “the autonomy of art”. Zentrales Thema des Forums „Russland versus Russland. 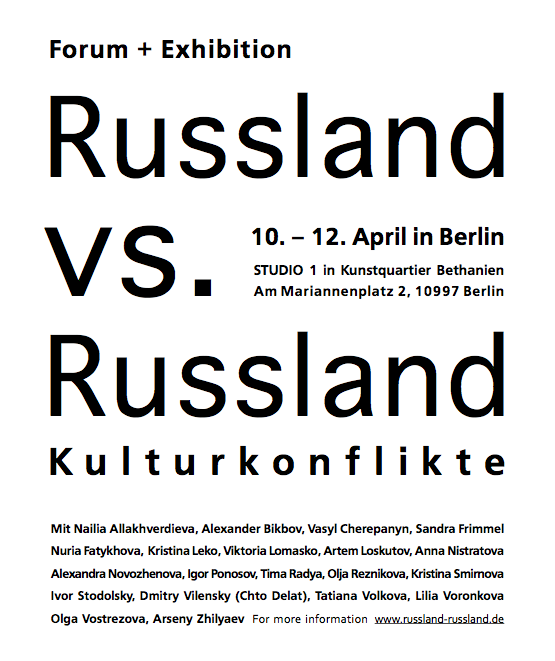 Kulturkonflikte“ sind die Wechselwirkungen der zeitgenössischen Kunst in Russland mit urbanen, sozialen und politischen Kontexten und die dabei entstehenden Widersprüche.